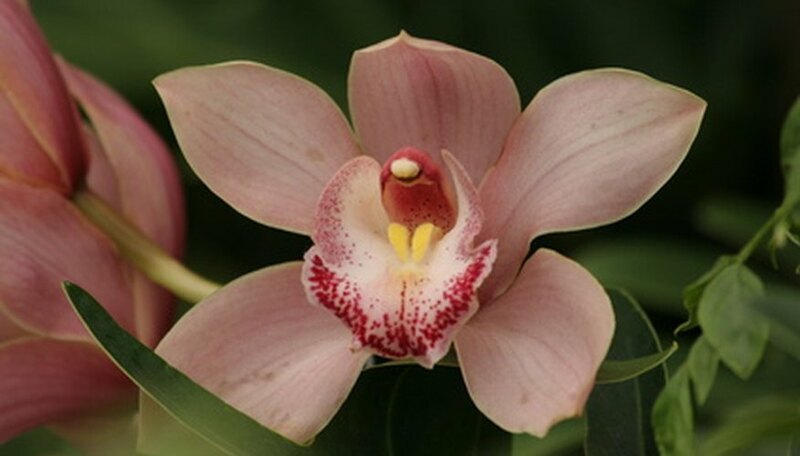 Cymbidiums are large orchid plants that originated in the Himalayan Mountains and other areas of Southeast Asia. Unlike many other types of orchids, cymbidiums require bright filtered light in the daytime and cool temperatures at night, which makes them better suited to outdoor growing conditions than indoor. In temperate climate zones, cymbidiums can live outdoors year-round. Once every three to four years, cymbidiums respond well to transplanting to replace depleted orchid bark, give root-bound plants more space and allow for division into more plants. Purchase a pot that is only about 2 inches larger in diameter than your cymbidium's current pot if you plan to keep it as one plant without dividing it. If you plan to divide it into several new plants, choose pots that will be large enough for each piece. Remove your cymbidium from its current pot. If it is root-bound, you might need to slide an old kitchen knife down the sides of the pot to loosen the plant. Shake the plant gently to remove as much old potting bark as possible from the roots. Discard old bark. Cut off all roots that appear dead and those that are compacted. Between cuts, wipe the blades of your clippers with a rag dipped into a solution of one part bleach to nine parts water to sterilize them and prevent spreading any disease that might be present. Divide your cymbidium by cutting away three to five groups of attached bulbs at natural divisions between them. Fill your pot or pots about half full with orchid bark and then set each plant so the bulbs will sit just below the bark surface after you fill the pot. Try to position the plant so its new growth is centered in the pot. Pour more orchid bark into the pot to just cover the cymbidium’s bulbs. As you are pouring the bark, firm it gently with your fingers. The professional growers at Santa Barbara Orchid Estate recommend that cymbidiums be grown in fir bark or 1/8- to 1/4-inch chips of coconut shells.